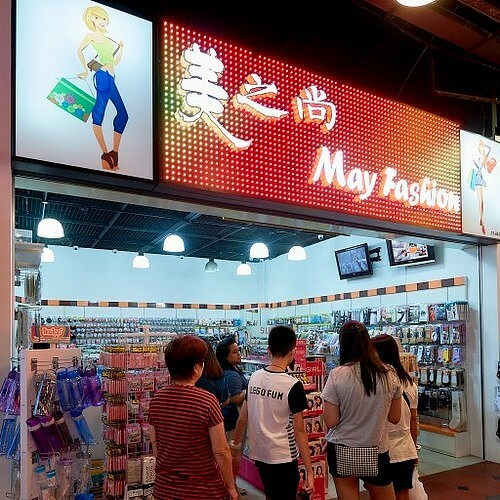 Fashion accessories store May Fashion has two locations in Singapore, one at Jurong Point shopping centre (1 Jurong West Central 2) and another within West Mall (1 Bukit Batok Central Link). …sundry goods, handphone pouches, hanging accessories, socks, stockings, leggings, and cosmetics. Of the stores, the one at Jurong Point is within Singapore’s largest suburban mall with more than 400 retail and food outlets to choose from. Jurong Point mall is anchored by household names such as FairPrice Xtra, Golden Village, Courts, Harvey Norman, plus there are three food courts (Kopitiam, Cantine, Malaysia Boleh), and a number of themed precincts.